OK- I know this is a bird-oriented blog, but about any birder I know also is interested in lots of natural history including the wild mammals we encounter on our birding endeavors. I’ll admit to several birding trips I’ve been on, both alone or as a group leader, where a mammal was the day’s highlight. 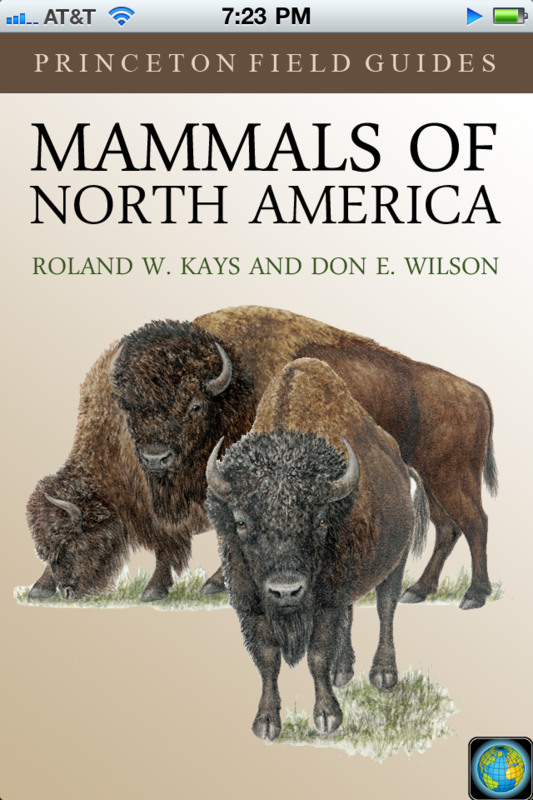 Princeton University Press, a long-time leader in birding publications, has just released their first field guide app for iPhone (with Blackberry & Android versions promised soon): Mammals of North America. 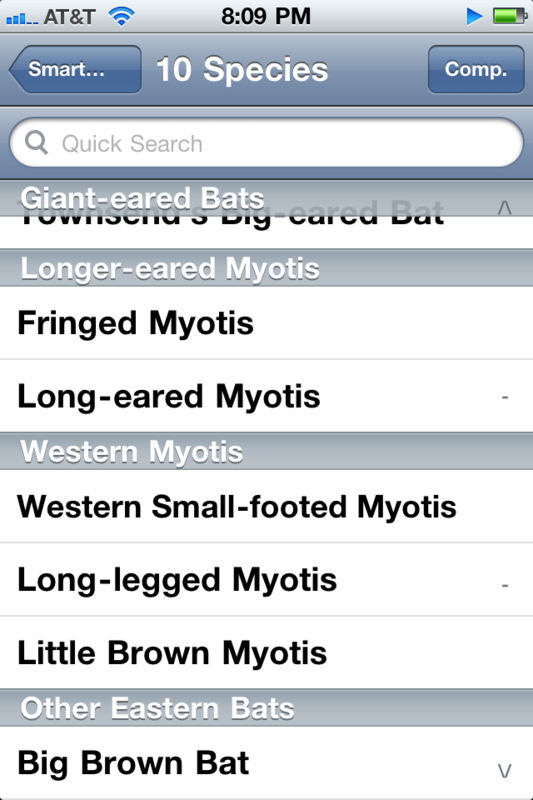 The app is based on the popular and best-selling field guide by Roland Kays and Don Wilson. The guide is designed by Cool Ideas, LLc, who also designed the Sibley eGuide to Birds. The architecture of the app is very similar to the Sibley eGuide and I think it is an intuitive, friendly & information-rich interface. 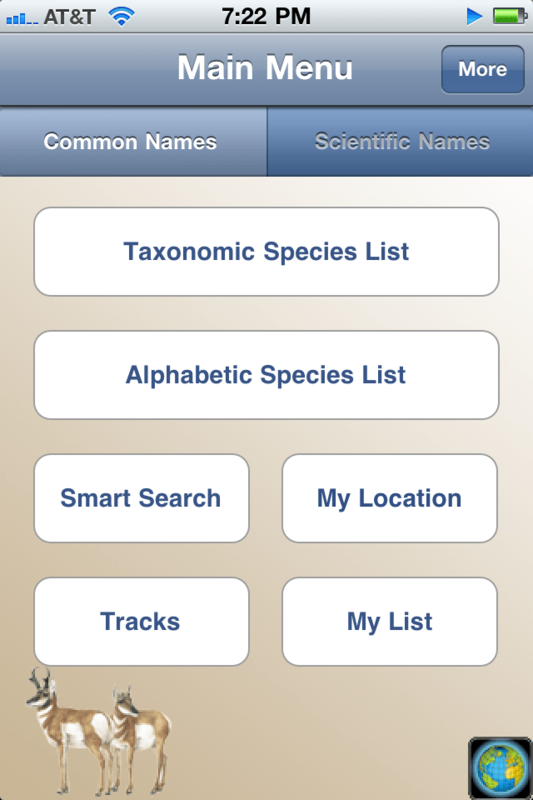 For those wishing for a comprehensive guide to our taxonomic classmates without dragging another book along, this is an amazing resource to squeeze into one’s smartphone. The publishers were kind enough to send me a review copy and I know it will earn a permanent spot on the virtual bookshelf I carry in my pocket about everywhere. 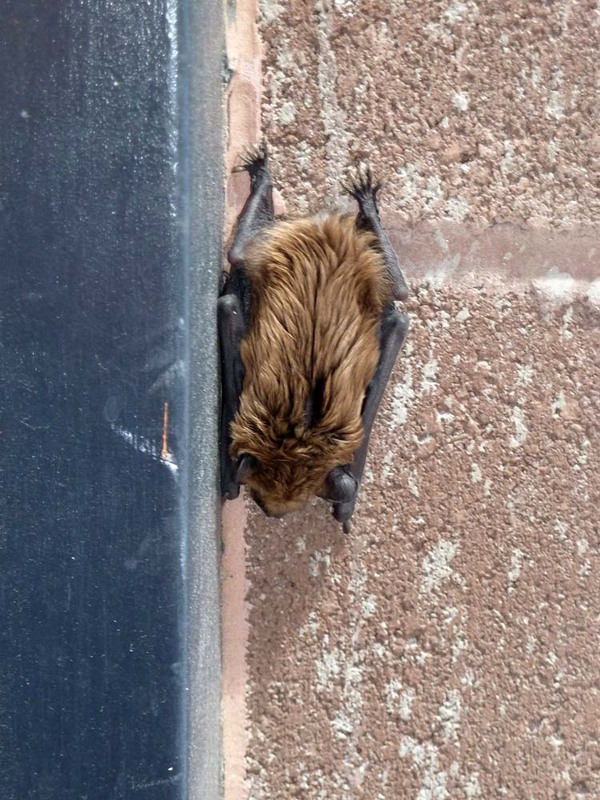 A few weeks ago I was alerted to a bat roosting along the corner of a wall at a local fire station. I snapped a pic but hadn’t had the time or impetus to research its identity until this app came along, so I’ll use it as a test case to give you some examples of how it all works. 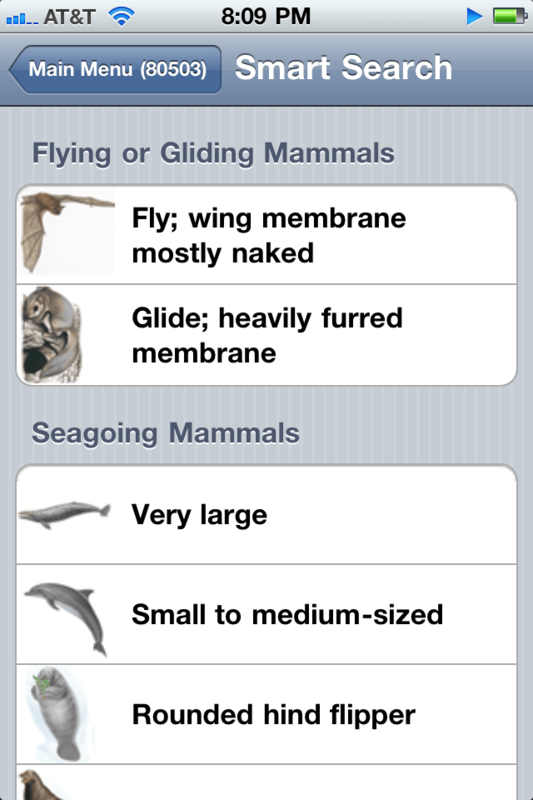 The app begins with a single simple menu page with options to look at mammal lists alphabetically or taxonomically. 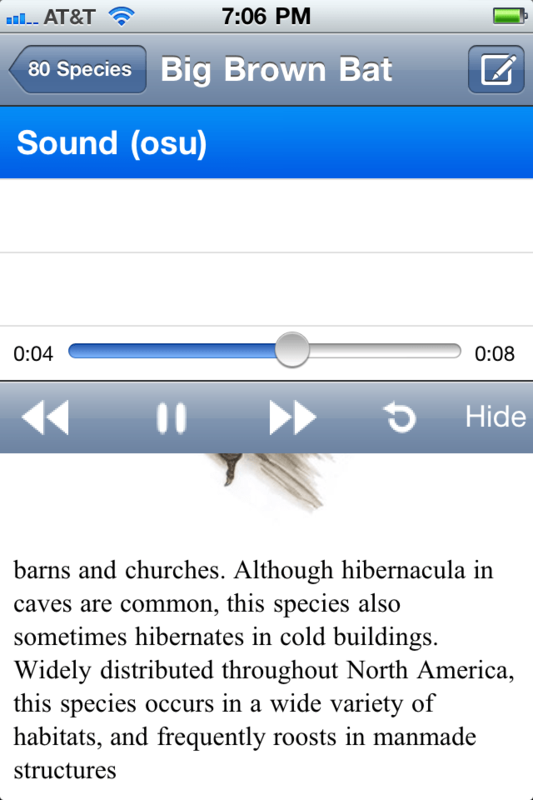 This can be done by common or scientific name, selectable near the top. There’s also a smart search that groups mammals by general type (very helpful to a novice like me) and a button to set one’s location and limit the choices to that area. Another button leads to a gallery with mammal tracks (4 pages organized by similar shapes for comparison) and one more link accesses a listing feature that you can keep track of sightings with. 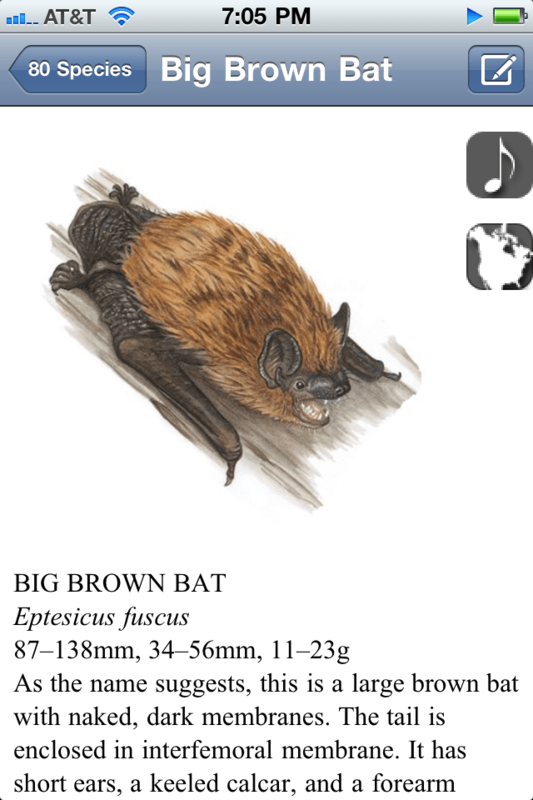 Finally, there’s a treasure trove of information under the “More” button at the top right, which leads to extra information such as help files, a glossary (I had to look up calcar and interfemoral membrane when I read about my bat), and bonus pinch-zoomable ID plates. Of special interest to pelagic birders are two plates of bow wave-riding dolphins & whales as seen from above and a plate showing whale & dolphin spout patterns & dive sequences. 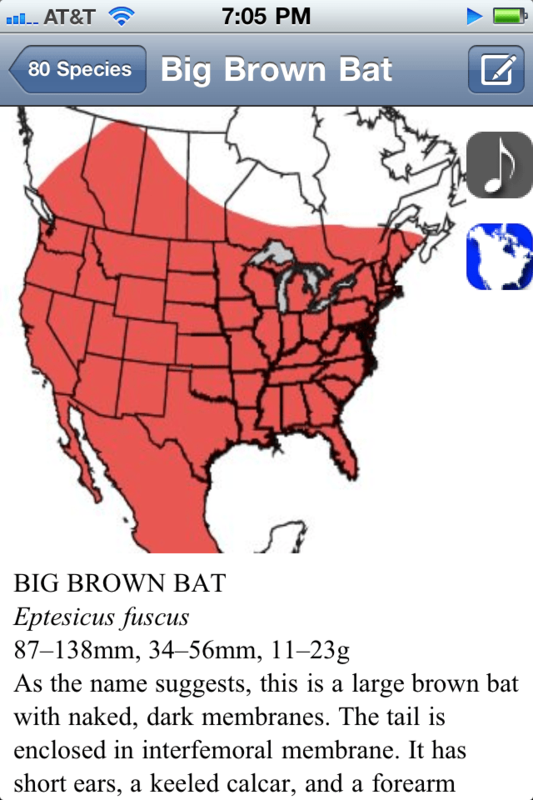 I thought I’d start by setting my location to research my bat. 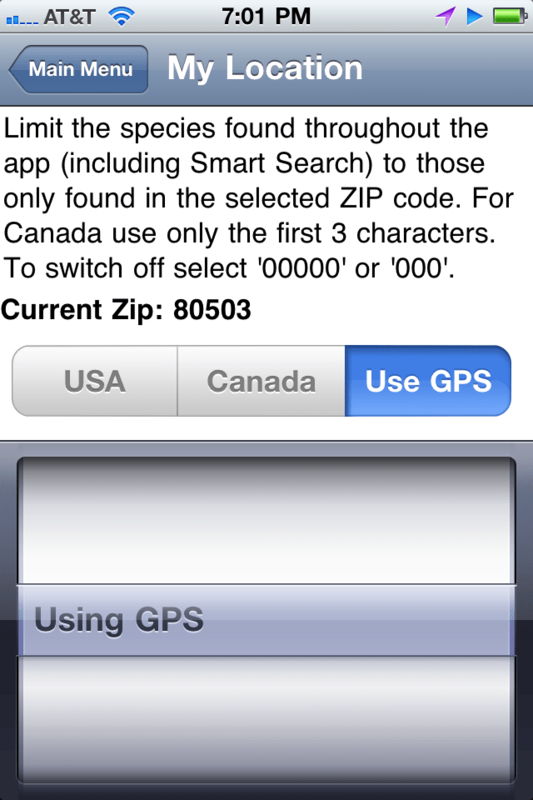 You can manually enter a zip code, but I made life easy and let my phone’s GPS tell the app where I was. 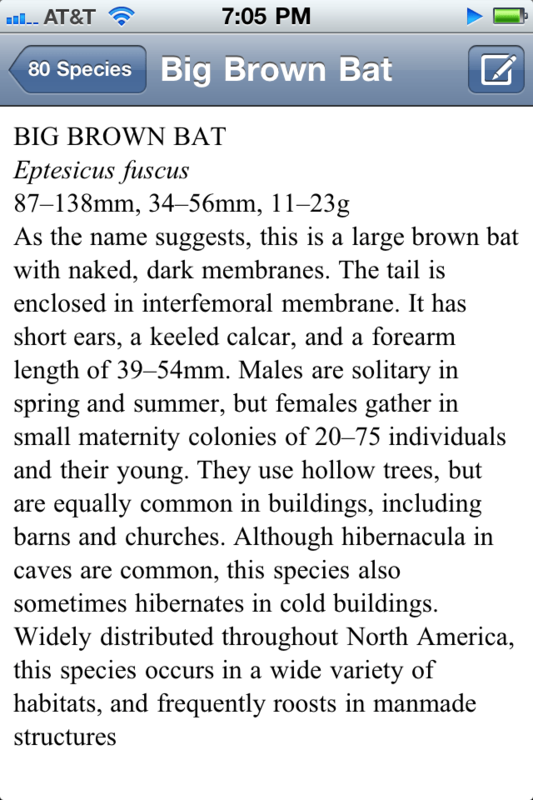 When I then went to the Smart Search and chose the “Fly: wing membrane mostly naked” group, I had 10 species of bats to choose from (whittled down from the 47 listed for all of North America, accessible by selecting the fictional ZIP code 00000.) Glancing through these, a match of Big Brown Bat seemed quite good to my novice eyes.